A 25 year-old food vendor from Eastleigh, Mohamud Abdikadhar Ali, has become the latest person to win Ksh. 1 million in the Safaricom Shukrani KochoKocho consumer promotion. The third born in a family of ten, who works at a roadside kiosk, dropped out of school in Class eight due. He lost his father at a tender age and his ailing mother could not afford to keep him in school or provide for the family’s basic needs. He moved to Nairobi from Kitale at the tender age of 15 to look for menial jobs to help his mother and siblings. He plans to start a catering business in weddings and at big gatherings. “I am very relieved by this win. It will really transform our lives – my siblings and I. I have had a tough time trying to make ends meet for ten years now. Today is a turning point for me. I intend to become a certified Chef and start a catering business. The money will go a long way in advancing my siblings’ education and taking care of my mother’s medical expenses. I thank Safaricom for celebrating me today,” said Ali. Other winners who have won Ksh. million in the fifth week of the promotion include: Clesencia Osebe Guto, a 52-year old farmer from Kisii County, Nyanza region; Stephen Achola, 37, who works at a children’s home in Machakos County, Eastern region; Boniface Macharia Chege, 29-year old carpenter from Nyandarua County, Central Kenya region; Suleka Haret Nur from Garissa, North Eastern region and Hesbon Oyiel Ogwangi from Western region. Nairobi and Coast winners will be announced in the coming week once the winners are reached. 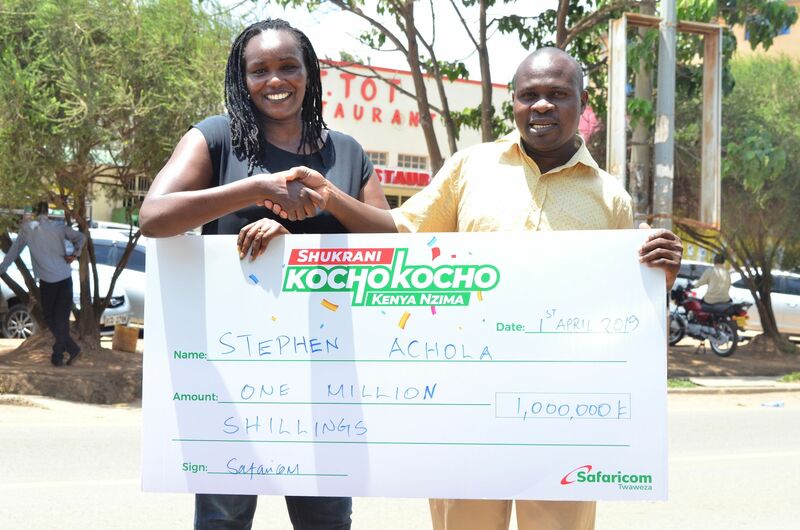 The promotion enters its sixth week and has so far seen more than three million customers from across the country awarded with weekly cash and daily airtime prizes worth millions of shillings. In addition, more than 500,000 customers are expected to win cash prizes of Ksh. 1,000 and above while more than 5 million other customers stand to win daily airtime prizes.